Colonel Ford J. Lauer enlisted in the Air Force in 1925 when it was a part of the US Army. At that time known as the Air Service, it was under control of the US Army Signal Corps. The Air Service was re-designated as the Army Air Corps in 1926. The Air Corps was small, possessing no more than a few hundred airplanes and some observation balloons. Rated pilots numbered less than one thousand, most of them being reservists. Military aviation at that time was a risky occupation. Airplanes were not reliable and were commonly referred to as "crates" by the pilots. They were officially referred to as ships. Radio communication was in its infancy, and there were no flying aids to speak of. Cockpit instruments consisted of no more than engine gauges, an inaccurate compass, and a crude altimeter that was accurate only to within a hundred feet. Additionally the indicated altitude reading was always at least thirty seconds old. All airplanes had open cockpits, and the pilots were exposed to the weather. Thick leather overcoats had to be worn by the pilots to protect them from extremely cold temperatures and the constant blast of wind in their faces. Weather forecasting was primitive and unreliable by today's standards. Night flying was practiced, but was dreaded by the pilots. Crashes, or "wrecks" as they were called then, were commonplace. Pilots who survived their enlistments were lucky. To survive a flying career was a miracle. Pay for military pilots was about one fourth that of civilian pilots. As a result most pilots moved on to civilian jobs after completing their initial military obligation. This left a small core group of career pilots who throughout the 1920s and 1930s, transformed the Air Corps from an observation and support arm into one with offensive capabilities. Lauer was a member of this core group. Other members included Henry Arnold, Ira Eaker, Carl Spatz, Frank Andrews, Curtis LeMay, Nathan Twinning, Caleb Haynes, Robert Olds, Torgiles Wold, Robert Peaslee, D.H. Alkire, and Ralph Koon. Some of these names later became well known, while others remained obscure. All of these men together became the "Fathers" of modern military aviation. Though he possessed only a high school education, Lauer was an extremely intelligent individual. He was born August 18, 1905 at Wawaka, (Noble County), Indiana. He was the son of a farmer. Being mechanically inclined, Lauer built a motorized bicycle as a boy. Also very athletic, Lauer was captain of his high school basketball team. He graduated from Wawaka High School in 1923 with very high marks. After driving a truck for a year, Lauer decided he wanted to do something else with his life. He had heard of the exploits of World War I pilots, and had seen the "Barn Stormers" of the day displaying their feats. With his father's consent, Lauer enlisted in the Air Service. Early in his flying career, Lauer established himself as a very talented pilot. Despite being burned in a fiery crash during flying school, he resumed training. After completing flying school, Lauer was stationed at Mitchell Field on Long Island, New York. Long Island was by all accounts "The Cradle of Aviation." The Grumman, Republic, Vought, and Curtiss companies among others were located on Long Island. The pilots stationed at Long Island therefore took advantage of the opportunity to fly the latest airplane designs that rolled out of the factories. Lauer quickly gained a reputation as a natural stick and rudder man, and was referred to by several persons who served with him as "one of the most superb pilots" they ever knew. Throughout the late 1920's and into the 1930's, aviation records were being set and broken weekly. New airplane designs were being introduced at a rapid pace. For the pilots of this era, flying was extremely exciting but also hazardous. The only way to test new airplane designs was to fly them. Many of the pilots were maimed or killed in crashes. Lauer became one of the original four engine pilots of the Air Corps. He was a member of the famous 2nd Bomb Group at Langley Field during the late 1930's. The 2nd was selected to receive the first thirteen Boeing B-17 bombers in 1937. With the B-17, the men of the 2nd developed long range precision navigation. They also developed the concept and methods of flying long distances in formation to bomb specific targets, thus giving the military a new offensive air arm. Many of the methods they developed are still used in today's modern Air Force. In addition to the difficulties of developing this new air arm, the men of the 2nd also had to fight a daily battle just to ensure its continuation. The Navy's battleship admirals protested strongly to the US Congress that the Air Corps was encroaching in their area. At this time the US was an isolationist nation, which saw no need for offensive weapons. The B-17 project had been approved by congress as a coastal defense weapon. The battleship admirals reasoned that the Navy was solely responsible for coastal defense. As if attacks by the battleship admirals weren't enough, the B-17 project was also attacked by the Army's infantry generals. Being a part of the Army, the Air Corps was subordinate to those generals, none of whom were pilots. The generals insisted that the Air Corps mission was to support the infantry. They refused to consider the airplane's value as an independent weapon. In the end, the B-17 project was saved by a handful of farsighted US Congressmen who were uncomfortable with events happening in Germany and Japan. As the United States prepared for and entered World War II, the men of the 2nd Bomb Group at Langley were siphoned off to form new bomb groups. As soon as the new groups were established and the expertise passed on, the process started again. In this way, Lauer established the 34th Bomb Group in May of 1941, the 303rd Bomb Group in February of 1942, the 15th Bomb Wing in June of 1942, and the 304th Bomb Group in September of 1942. Organizing and training new groups was accomplished at a frantic pace, and severely tested the metal of the commanders. These were men who had been accustomed to functioning in a peacetime environment with well-trained pilots. The urgency of World War II necessitated throwing young men with minimal flight training into combat. To make matters worse, equipment, supplies, and especially airplanes were in short supply. While in command of the 304th Bomb Group, Lauer became aware that the 2nd at Langley was scheduled for deactivation. Lauer succeeded in having the 304th trade designations with the 2nd in November of 1942. The 2nd was the oldest group in the Air Corps, dating back to World War I, and Lauer desired to have its name and traditions live on. The 2nd lives on to this day, flying B-52's, and they owe their existence to Lauer's resourcefulness. Beginning immediately after the Japanese bombing of Pearl Harbor, the 34th Bomb Group, with Lauer as its commander, flew patrol and antisubmarine missions off the coasts of the United States. As commander of the 15th Bomb Wing, Lauer participated in the bombing of Dutch Harbor, Alaska in the summer of 1942. The Japanese had invaded and occupied Alaskan soil primarily as a diversion for their invasion of Midway Island. After completing the group's training, Lauer took the 2nd (former 304th) Bomb Group overseas in March of 1943. Soon after arrival however, he was transferred to Headquarters, North African Theater of Operations. His exact duties are unknown. He served in this capacity until being placed in command of the 99th Bomb Group, 15th Air Force. The 99th flew B-17s out of Tortorella, Italy. Prior to Lauer taking command, the 99th primarily bombed bridges and railroads in northern Italy. Under Lauer, the 99th was tasked with taking the war into the heart of southern Germany and the occupied countries to the south and east. The German air forces fought fiercely to defend their home skies. With every mission the bombers flew the gauntlet of enemy fighters and flak. Enemy fighters concentrated their attacks on the group leaders in an effort to shoot them down and break up the formations. Lauer forced the 99th to tighten and improve their flying formations, which resulted in higher concentrations of bombs on target. On February 25, 1944, Lauer led the 99th into what became one of the bloodiest air battles of the war. The target was Regansburg, Germany. The group was attacked by an estimated eighty German fighters, and there were no allied fighters to provide protection. The fighters intercepted the group after it crossed the Alps, and stayed with it to the target and all the way back to the Alps. If not for Lauer's expertise and resourcefulness in holding the formation together, the entire group would have been scattered and annihilated. Lauer was awarded the Silver Star for this mission. Lauer was also awarded the Distinguished Flying Cross for leading a mission on April 23, 1944. The target that day was the Weiner Neustadt aircraft factory in Austria. Despite his airplane being severely damaged, he held the 99th together for a successful bombing. In June of 1944 he commanded the first shuttle bombing mission into Russia. Being able to continue on and land in Russia made it possible to bomb targets that were otherwise unreachable. Lauer was awarded the Legion of Merit for this mission. After twenty-one months in the European Theater, Lauer was transferred back to the US. In January of 1945, Lauer was placed in command of the Consolidated B-32 "Dominator" bomber development project. His duties involved flight evaluation of the 140,000-pound bomber. The B-32 project served as backup to the Boeing B-29 project, in case it failed. As it turned out the B-29 was highly successful, and the B-32 project was soon cancelled. 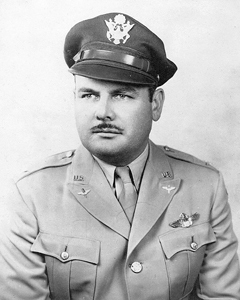 After World War II ended, Lauer was placed in command of Johnson air base in Japan as part of the occupation force. After returning to the United States in 1947, Lauer commanded several airbases. He retired from the newly created United States Air Force in 1949. Lauer made many friends during his career and earned the respect of his peers. Men who served with and under him have stated that he was a compassionate leader. He was known as a "Soldier's Colonel." They have also stated that he was a perfectionist when it came to flying. Several have attributed their surviving World War II to him. Upon his retirement in 1949, Lauer had accumulated over 8000 hours of flying time in over 100 types of airplanes. Though 8000 hours today is common, it was an unheard of total for the time period of Lauer's career. 600 of those flying hours were in combat, in both the European and Pacific theaters. Lauer passed away in 1964, and was buried at the Fort Sam Houston National Cemetery, San Antonio, Texas.